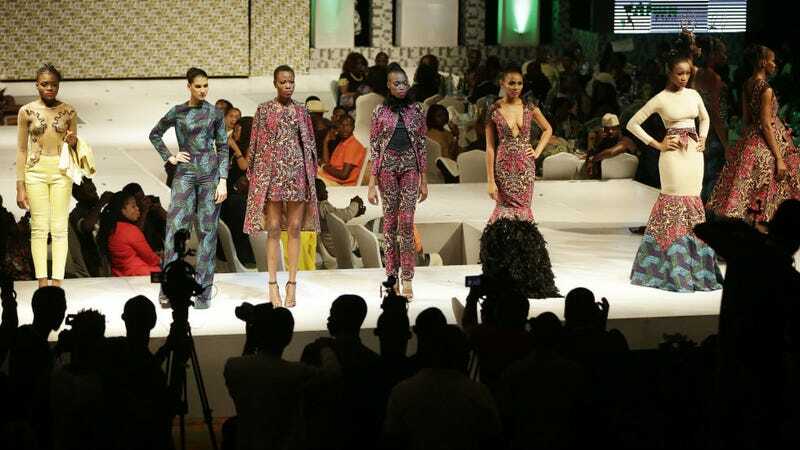 Africa Fashion Week Nigeria began Saturday in Lagos, and already there are a clutch of runway clothes for which I’d gladly hawk my whole wardrobe. Lovely prints were key, as some designers played with new ways of incorporating ankara and jacquard, all in super-modern silhouettes and bright color saturation that looked like the equivalent of biting into a grapefruit on a hot morning. At top, LINES by CHAAB presented smart pantsuits and gowns in similar patterns, a new take on dressing day to night with ostrich-feather collars and long-hemmed onesies. But I’m especially into the sheer gear top on the left—it’s very delicate and Blade Runner at the same time, plus pedal pushers the color of popcorn butter jellybeans is feeling right about now. At left, Adaora’s designs are full of regal excess, a queenly designation with that high collar and oh my god those SLEEVES. At right, gowns by FAW Couture designer Saheed Fawehinmi show off his intricate detailing; I’m especially in love with the lace ruffles sewn into the skirt with the face up top. Imagine wearing these Olayinka Clothing designs all summer? Can I get that yellow caped blouse immediately? The two images at left showcase a super sophisticated vision by Anuba Couture blended with a throwback to the tailoring of the horse-and-buggy era; you can totally imagine them stepping off a carriage en route to the opera. That adorable flower crown-capped overall dress is by Buchiver, while Enkay Stylings crafted those beach-perfect crop tops and maxi skirts. Hello, welcome to the world of Maufechi, which is my absolute favorite: The third dress in, with the lace train and ankara top is a dream gown—is that a beaded collar! But everything is sublime and lovely, even to the voluminous draping. Aren’t non-corporate fashion weeks the best?